Catholic teaching presented without Social Justice is simply not Catholic teaching. For the Church or any of its component parts to attempt to live the Christian life devoid of Social Justice is tantamount to spitting in the Face of Christ. Happily, the great gift of Francis, our Holy Father is to awaken us from our slumber, to help us see in the plaintive look of the hungry child, the traumatised refugee, the desperately dispossessed, and the marginalised poor, nothing less than the face of the suffering Christ who begs of us compassion and Christian action for justice. What an inspiration this old man is to the tired Church of the First World. What a galvanising effect he has been to a self-serving developed world. His words have found new voice in the resolution of some State leaders in Western Europe who are preparing their nations to absorb the waves of refugees from Syria in the greatest effort at resettlement of displaced persons since the end of World War II. I have wondered often lately, if I had my time again, about how much more could be done to combat what I consider to be the greatest scourge on the soul of this nation: Racism. Some weeks ago, after a trip out bush away from any media frenzy, I became vaguely aware of the controversy surrounding Sydney Swansplayer, and a former Australian of the Year, Adam Goodes. I was asked by one of our Sisters had I been following it all. She commented that in a way, for her, it summed up all the sadness and disappointment of this country – that someone could be vilified because of their race, publically and without due shame – and that it should start with a vulgar and reckless remark from a young girl seemingly schooled in such vilification by her elders. Didn’t it just show how hard it is to be Aboriginal, and proud, in such a toxic and tormented environment, the Sister mused. It set me thinking about our past as a Diocese here in Broome, the how and the why of our coming to be. And how it is, at the kernel of our calling, to love God and neighbour, fully, in truth and in justice. That evening I experienced the most fruitful of meditations. My daily examination of conscience had more energy about it than usual. Wasn’t this part of all of our Missionary endeavours I prayed – to bring good news to the poor, to proclaim liberty to captives and recovery of sight to the blind, to let the oppressed go free. I have been trekking on those lines these past few weeks. And I am asking myself where am I in this debate that surrounds Adam Goodes, where is my Diocese, and where is my country? Historically, racism as it has existed in this country and as it continues to manifest itself still today has dealt the moral worth of this Commonwealth of ours some savage and reprehensible blows. From our very beginnings as a colonised entity, our treatment of Australia’s Aboriginal and Islander peoples has been atrocious and unspeakable. I would contend that our race relations have been so fundamentally tainted by the evil of racism that it has scarred the psyche of this country’s peoples and continues to hinder, even today, our pathway to maturation as a nation. I believe that, at times and in places, the Church has a remarkable record in correcting the abuses spurred on by racism and greed, so evident in our written history. I cannot think of a better banner or manifest under which to mount a concerted effort against racism and all policies that have their genesis in racist attitudes – except perhaps under the banner of the Gospel itself. In the Kimberley, this has been a Church of the people and with the people, unashamedly poor in material goods but rich in the wealth of its generosity towards others and in its affinity with Gospel values. The service of the Church in the Kimberley has so often been a countersign to those forces that have exploited local indigenous peoples. It has stood openly in opposition to the power of racism, which along with greed is the engine room that drives the exploitation of peoples and excludes them from just participation in the common wealth of the region. The Church is called to stand in solidarity alongside of indigenous leaders, to be with the marginalised and the oppressed and to do so while proclaiming the mantle of Christs love. I believe the Church in Australia is called to be bold in its service of Australian society – even though we so often appear these days to be on the back foot. We share a unique moment in the pages of our country’s history and we are being well prepared as we learn humility which we know is the foundation of all Christian endeavour. During these days of the Royal Commission into Institutional Responses to Child Sexual Abuse, our Church is being scrubbed clean of the soot and grime that comes from arrogance, power, and atwisted sense of vocation. I believe in the growth of a Church in Australia that is devoid of racism, one that actively promotes the fundamental option for the poor, and ceases to be a parody of royal courtism and dated ecclesiastical nonsense. The Holy Father has spoken clearly in recent times of the evils ofclericalism and the blandishments of wealth. Are we listening to him? Will we be courageous enough to follow him in our pursuit of a just Church in a just world. 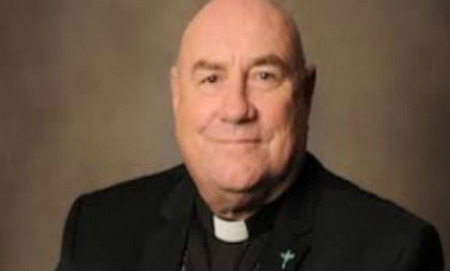 - Broome’s Bishop Christopher Saunders was on the Australian Catholic Bishops Conference’s Australian Catholic Social Justice Council the past 12 years, nine of them as Chair.